Treat yourself to an exclusive upgrade to your day stay in our textile family area of the Therme Erding and reserve your private lounge or lounger before your stay. Your visit will be an unforgettable day of relaxation. Our exclusive Family Lounges and Alm Chalets offer peace and relaxation in a unique feel-good atmosphere. The lounges can be locked with a code and can accommodate up to 6 people. Equipped with large resting shells, HD TV, Free Wi-Fi, air conditioning, refrigerator and many more, a comprehensive catering package for you and your loved ones is already included. 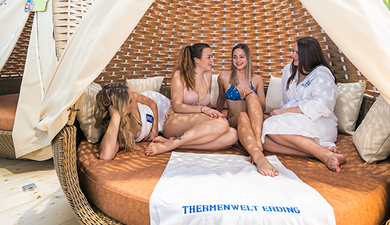 New high up in the cascade room of the Galaxy Erding, you will find our new lounger gallery, the Relax Island, with bookable Family Relax Eggs and resting shells, which can be perfectly combined with a short stay in the Therme.